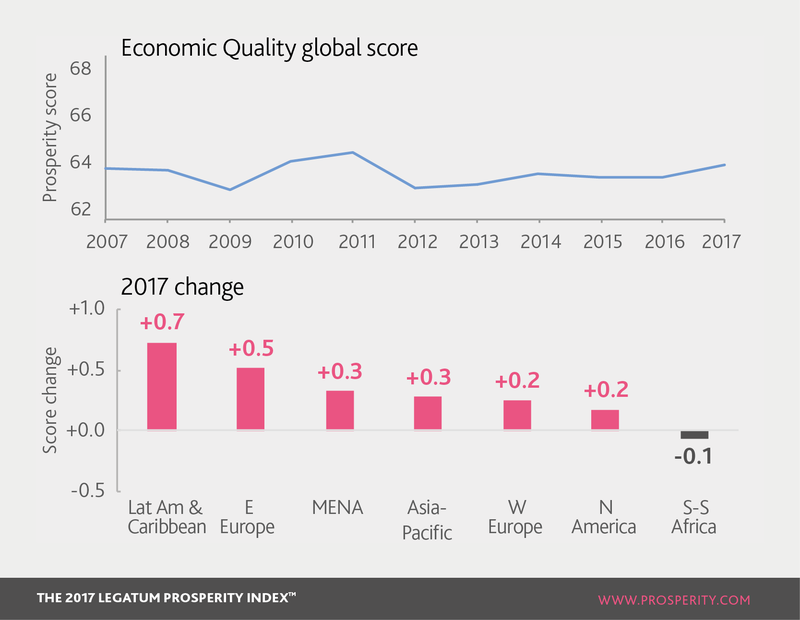 The world’s Economic Quality has improved only fractionally on 2007 levels, although in the last five years the score has recovered from a low in 2012. Latin America and the Caribbean rose fastest in 2017 and only Sub-Saharan Africa fell. In terms of gains, there are fewer people now in absolute poverty, with a higher number of people reporting satisfaction with their standard of living than ten years ago. This is counteracted by slowing economic growth, signs that governments are less open to competition and a less engaged labour force. Standard of Living measures whether citizens have access to a range of affordable goods and services, and whether economic growth is persistent. Asia saw a marked increase in 2017 in the satisfaction of its citizens with their standard of living. Venezuela has seen the largest drop in citizens’ satisfaction with living standards in the last five years. Economic Inclusiveness means the degree to which everyone has the resources and opportunities to enable them to participate in society. Only 3% of people in the Central African Republic have bank accounts, compared to 99.7% in Sweden. In terms of the number of people living on less than $1.90 per day, 29 of the 30 most poverty-stricken nations in the Index are in Sub-Saharan Africa. The only other nation in the bottom 30 is Bangladesh. Anti-Monopoly Policy measures whether producers can compete freely in the marketplace and consumers have choice in what to purchase. Israel saw the greatest improvement in perceptions about the effectiveness of anti-monopoly policy. Among regions, only North America’s citizens perceived their nations to be more open to competition now than last year. Labour Force Participation assesses the extent to which population is participating in the workforce. Of the bottom 10 nations for female labour force participation, seven are in MENA. In Madagascar, although 86% of citizens over 15 are in the workforce, the country still has some of the worst poverty in the world. Trade Competitiveness looks at the extent to which an economy produces a diverse range of valuable goods and services in an internationally competitive manner with a wide set of trading partners. Despite ranking 44th overall for Economic Quality, Italy ranks third in the world for the quality and diversity of its exports. With oil rents amounting to 29% of GDP, Iraq ranks bottom in the world for the diversity of its exports. Openness to Trade is about how well an economy welcomes domestic and international trade. Sweden’s citizens perceived far fewer barriers to trade than last year, as the nation increasingly is opening itself for business. Businesses in Ecuador perceive worse non-tariff barriers to trade than any other nation in Latin America.